Spanish house Angel Schlesser has launched two new fragrances: Agua de Jazmin for women and Agua de Vetiver for men. Agua de Jazmin ~ a floral woody musk developed by perfumer Alberto Morillas. The notes feature mandarin, bergamot, grapefruit, cassis, tuberose, peony, gardenia, jasmine, cedar and musk. Agua de Vetiver ~ an aromatic woody fougere developed by perfumer Richard Herpin. The notes include tangerine, grapefruit, lemon, cardamom, cassis, green leaves, violet leaves, lavender, rosemary, mint, sandalwood, musk, vetiver and labdanum. 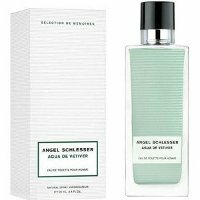 Angel Schlesser Agua de Jazmin and Agua de Vetiver are available in 50, 100 and 150 ml Eau de Toilette.